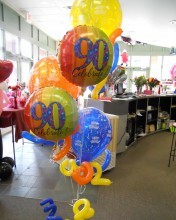 This beautiful bouquet features 3 oversized 16" printed latex balloons with our signature squiggles, 2 foils balloons with the appropriate age all weighted with a balloon topiary and squiggle accents. Don't forget to tell us your recipient's age - many different ages of balloons available. So go ahead, rub it in! Click the button below to add the Happy Birthday Numbered Balloon Bouquet to your wish list.